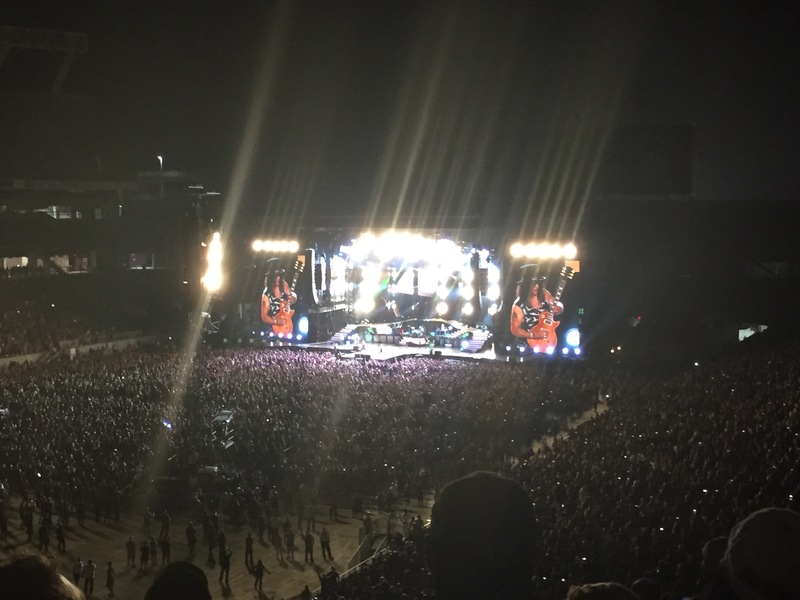 Guns n’ Roses with The Cult at the Orlando Citrus Bowl (aka Camping World Stadium, fka Tangerine Bowl) on 7-29-2016. My view from Section P42, Row V, Seat 19. I simply don’t EVER recall having EVER bought a seat this far away in all of my concert wanderings. 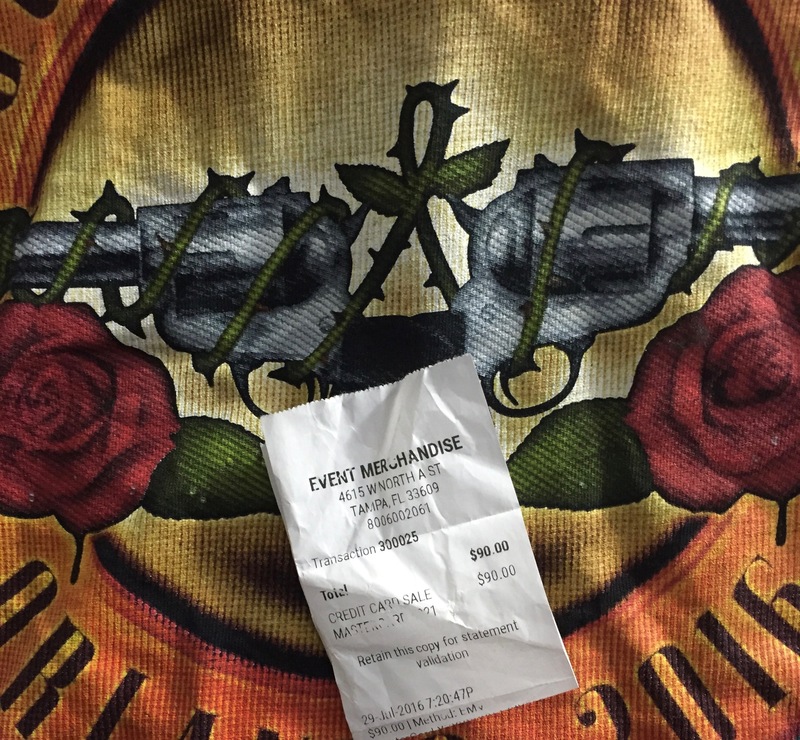 I watched the Guns n’ Roses reunion come together with interest but never quite committed to go – and then realized I should go, because “last” opportunities abound these days. It takes a certain show for me to commit to driving the traffic nightmare route to Orlando for a giant arena show with a nosebleed seat, but they did it – and of course it was all worth it. All of my Tangerine/Citrus Bowl ticket stubs. I hadn’t been to this venue since 1983 – I went to all of the old Tangerine Bowl concerts with my high school bff. So it was somewhat surreal to be there 33 years later and at the same time be able to text her in California. 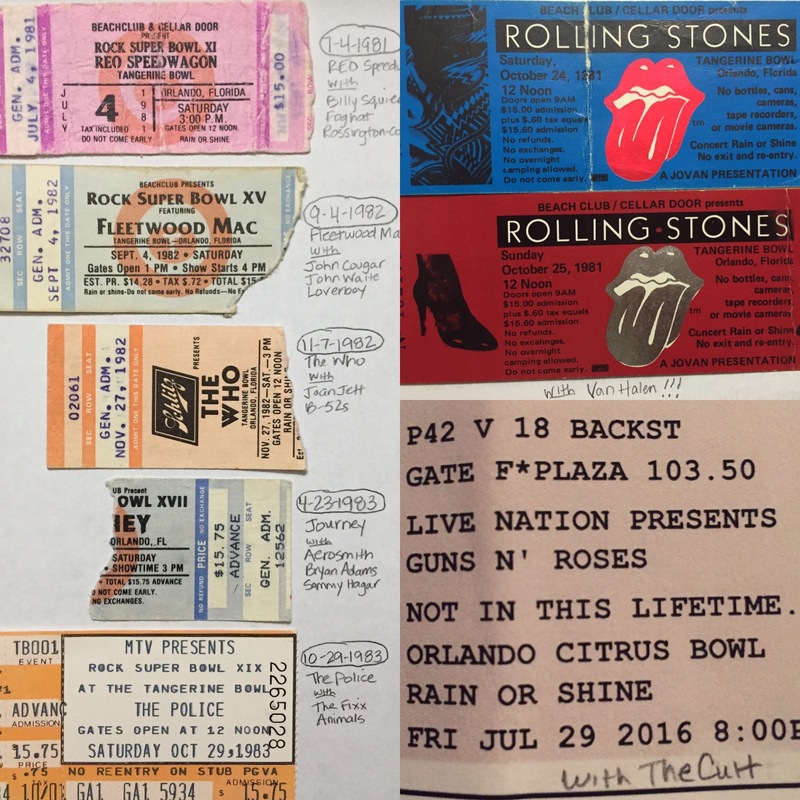 Back in the ’80s the tickets were General Admission, and we were either on the floor or stage right, one level up. I probably only remember this because of the picture I took of Mick Jagger with my 110-camera with the snap-on flash at one of the 1981 Rolling Stones shows ;o). When I finally went to buy GnR tickets the good ones were sold out or really expensive – we settled for seats way up high, but not all the way up, in the back. It worked because of the fantastic video boards and camera guys, and big graphics and big fireworks that made use of the entire arena in a good old-fashioned rock concert kind of way…there was a great energy. And the sound was fantastic, amazing, couldn’t have been better. But most of all, the musicianship was at its peak and it was pretty much the best you could have hoped for – a bunch of really talented guys who have honed their craft and brought it to a new level. I hate to say matured, but the great jam sessions that popped up here and there can only come with experiences. Rolling Stones at Orlando Tangerine Bowl 1981 – photos taken with my 110-camera with disposable pop-on 4-way flash. The video boards were great – otherwise the band seemed like ants. So I tried my best to be present in the Citrus Bowl despite the nostalgia flooding through me from memories of high school concerts and Sunset Strip days. I noticed the crowds: every age was represented. I was amazed by the merchandise sales. Everybody was happy, the beer and water lines were easy, and it was just a pleasant place to be in this crazy world, in an energy of the expectation of something good. GnR went on at about 9:50 and opened with It’s So Easy and fireworks, then went right into Mr. Brownstone with some classic Axl moves – it set the mood perfectly. 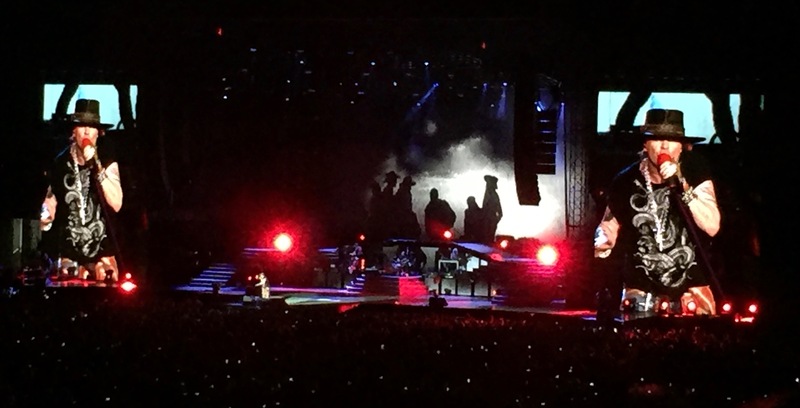 They did some Chinese Democracy, which I am completely unfamiliar with but my concert pal was, then continued to keep the mood with Welcome to the Jungle – that song, that line, that place in time, that thing that never gets old. The vocals were mostly good, the guitars kicked with some more-than-expected enjoyable jamming going on, keyboards were beautiful. The video boards were great, especially for the guitar. Live and Let Die led perfectly to the intensity of Rocket Queen – as always, the first half portraying an exciting danger and the second half a freeing of worries, a force that never fails to take me back – to You Could Be Mine, Civil War and a beautiful guitar solo (I’m told from The Godfather), Sweet Child O’ Mine, Better, Out Ta Get Me, amazing rendition of Pink Floyd’s Wish You Were Here, and a great Axl piano solo into November Rain. The sound was big and full and Knockin’ on Heaven’s Door and Night Train, The Who’s The Seeker and Don’t Cry, all great. The encore ended with Paradise City and a fireworks extravaganza that finished things off quite grandly – and I actually saw a REAL lighter amongst the cell phone glow at one point ;o). I will definitely go see them again, but next time around I’m planning on the upfront and personal experience. I’m so glad I went to this show. I think perhaps I didn’t trust that they could live up to all that they were, but they did. I also think I may have forgotten how amazing the music really is in the midst of everything else that they represent. All in all, it was good for the soul ;o). 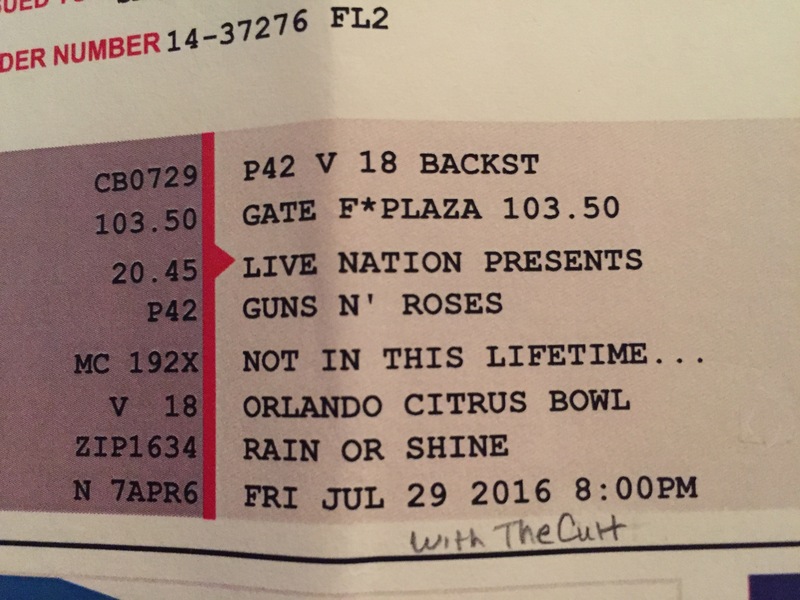 Guns n’ Roses with The Cult at the Orlando Citrus Bowl on 7-29-2016. Cost $125.30. Slash with Myles Kennedy & the Conspirators at Hard Rock Live in Orlando on 5-7-2012. A really good show but of course with a different essence – that Myles can sing sing sing. Adler’s Appetite at the State Theatre in St. Petersburg, FL on 10-17-2010. A FANTASTIC really good show. Steven looked so happy and played with that unique spirit – whoever that band and singer was that night, they all killed it. 1986 Thanksgiving Dinner photo collage at our North Hollywood apartment with some guys from Johnny & the Jaguars – Dizzy’s former band – and not sure who else. I remember Freddy bringing some guys from the Gardner Street studios and ruining the turkey, but I had no idea who these guys were when I pulled out the photos 20 years later and had to get together with bffs to put it all together. Great review and great photos, past and present! 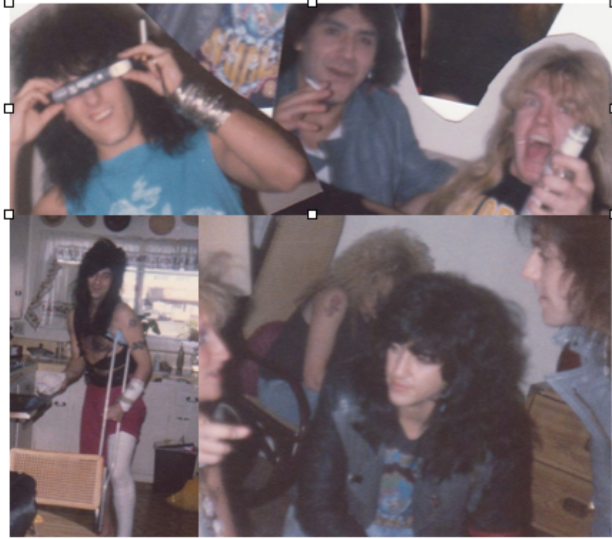 I’ve been trying to write about the emotional impact of 80s rock/metal lately and the line “then continued to keep the mood with Welcome to the Jungle – that song, that line, that place in time, that thing that never gets old” — that’s what I’ve been trying to say. Beautiful. Amy: Thank you so much for your comment! I’m so happy to hear I was able to convey that something special ;o). Wow, the emotional impact of 80s rock/metal – that’s a heady topic (to some of us anyways!). I very much look forward to reading it.